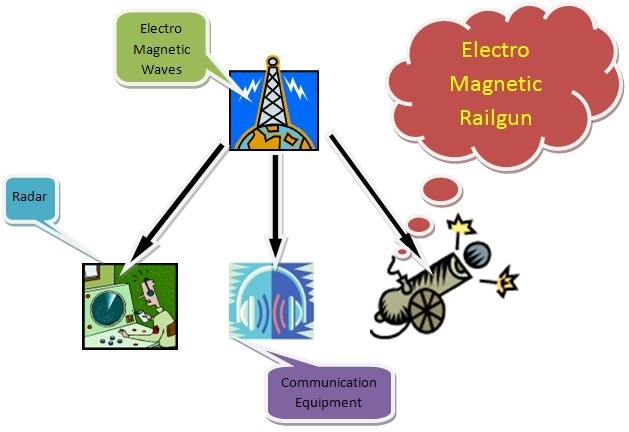 We so far know that in ships, Radar (Radio detection and ranging) uses Electromagnetic waves to findout the range, altitude, direction of both moving and fixed objects around the ship. 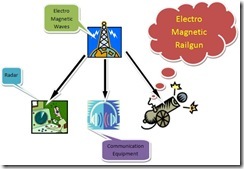 Further, Electromagnetic waves are widely used in communication equipments. Now US Navy has demonstrated on January 31, the use of Electromagntic energy to propel the projectiles in guns. So far explosives were used to produce high pressure gases in the guns to propel the projectiles. speed of the projectiles up to Mach 7.
impact velocity of about Mach 5 on the target. range upto 200 nautical miles. The performance of Electromagnetic Railgun proves that they are nothing lesser to modern, sophisticated Missile Launchers. Here is a video clip of the Electromagnetic Railgun test.